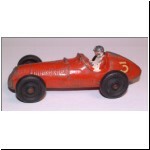 Continuing with the new introductions in the 1955 catalogue, numbers 32 to 34 were three racing cars which are some of the most sought after Charbens models. 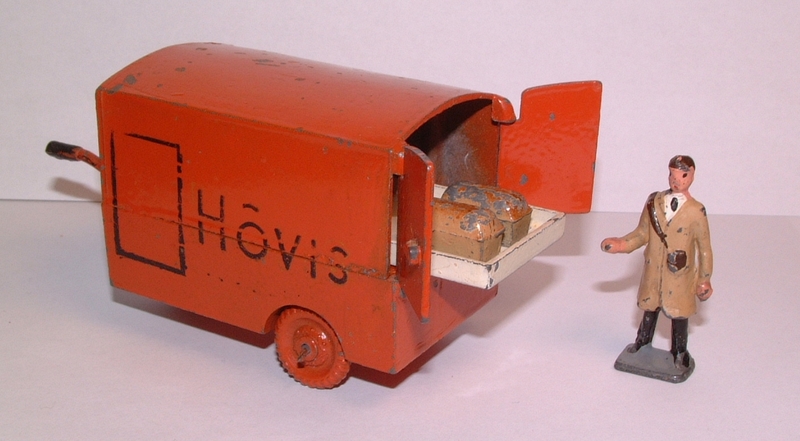 They were all copies of contemporary Dinky Toys (even including their colour schemes) but were unusual in being hollow cast in lead. 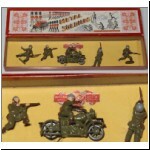 This made them an extraordinary anachronism in 1955, harking back to the toys of twenty years earlier. 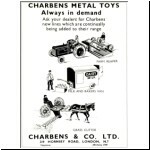 Charbens had embraced diecasting with open arms in 1946, and had re-tooled many of their pre-war lead toys to use the new technique - so why did they choose to go back to the antiquated hollow cast method for these three toys? 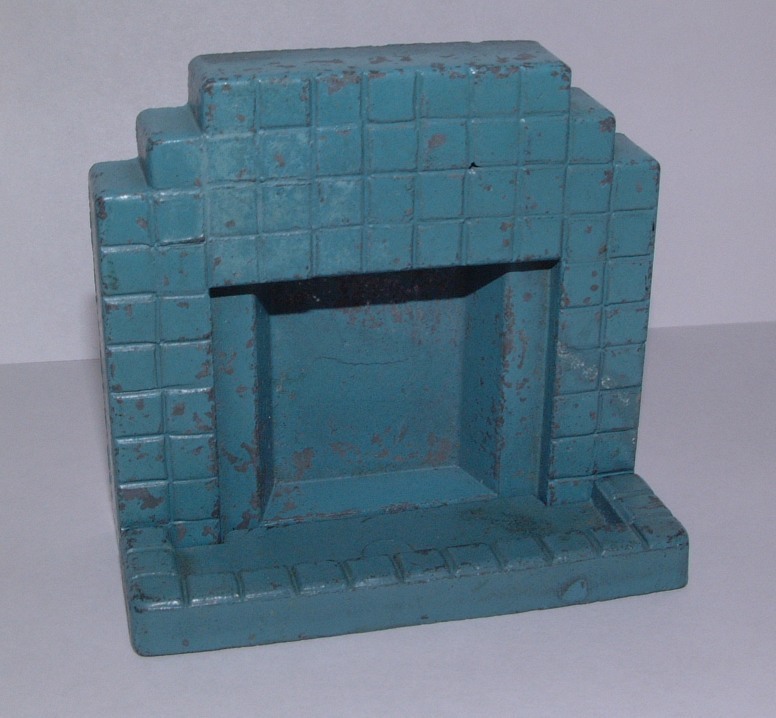 Perhaps recent memories of the zinc ban made them nervous of having all their eggs in one basket, or perhaps their diecasting capacity was fully used with the new Old Crocks series so that lead production was a way of getting more new toys onto the market. 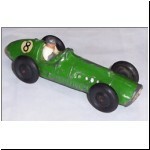 Anyhow, the racing cars are nicely made, even though they are not original designs, and are very hard to find now. 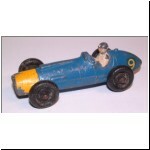 In the 1962 catalogue they were also offered in a "Grand Prix Set", containing four cars and six mechanics. Each car had number transfers (different numbers can be found) and the drivers had white overalls. 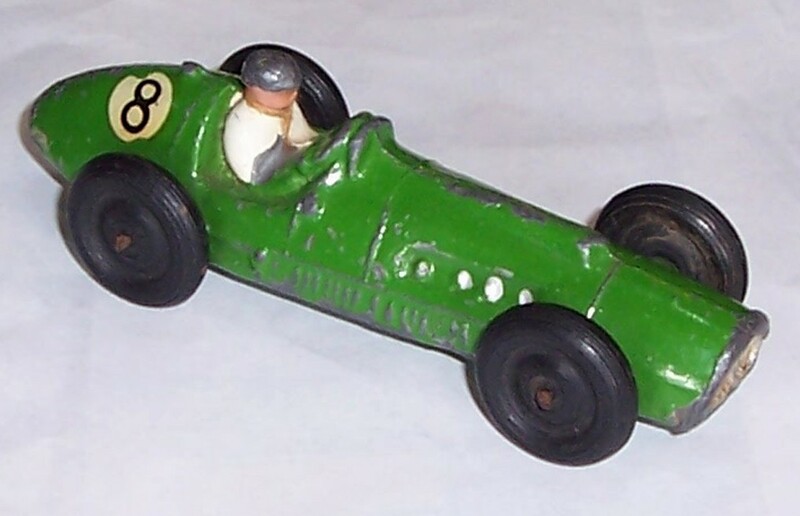 Wheels were solid rubber, of a type found on some other Charbens items, but also on some of the Lone Star Modern Army series - useful to know if your racing car lacks a wheel or two, since scrap examples of the Modern Army series are reasonably easy to find and cheap. The rubber wheels were obviously bought in by Charbens from a contract supplier. 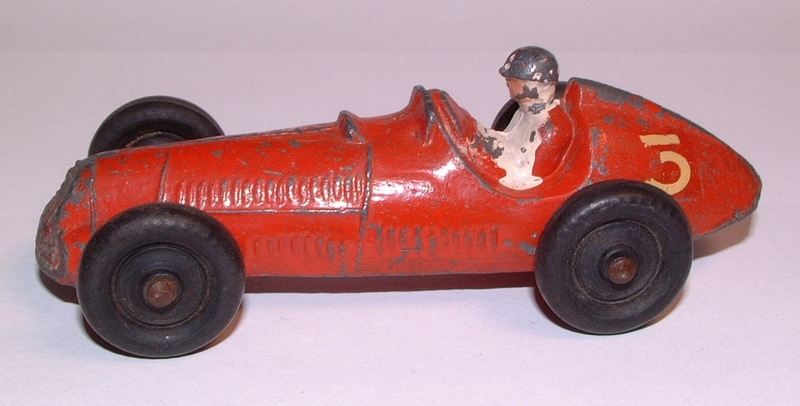 All three models had CHARBENS & CO MADE IN ENGLAND cast underneath, although an early Ferrari has been found with no lettering cast, see below. Length 98mm, 1955 to 1962, boxed in half dozens. 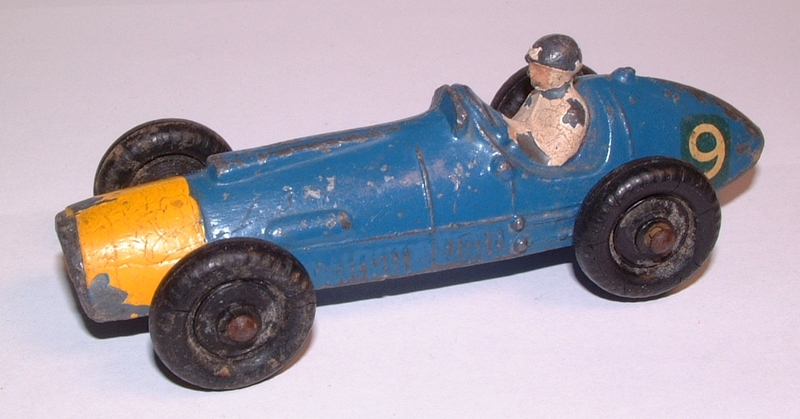 Copy of Dinky Toy no.232. Colour: Red. 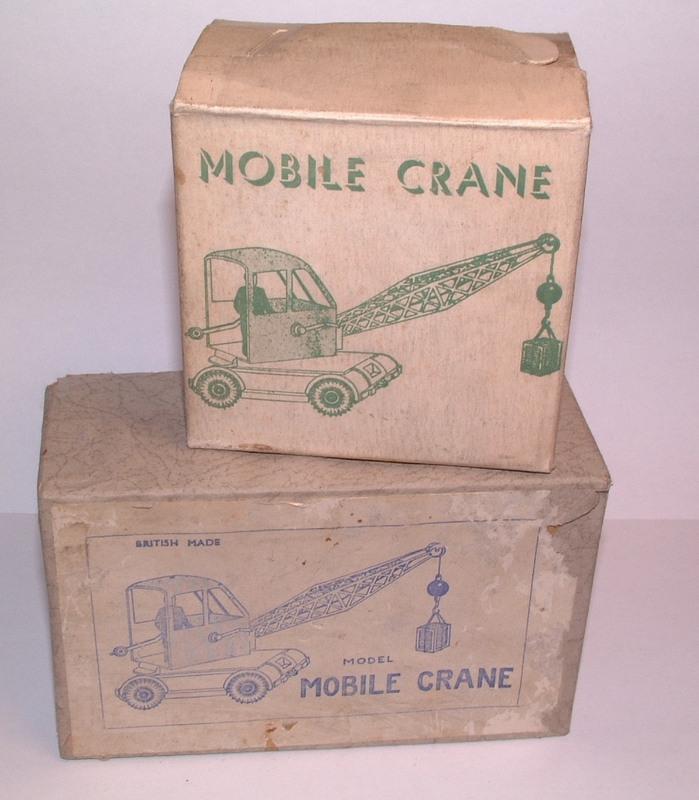 Length 90mm, 1955 to 1962, boxed in half dozens. 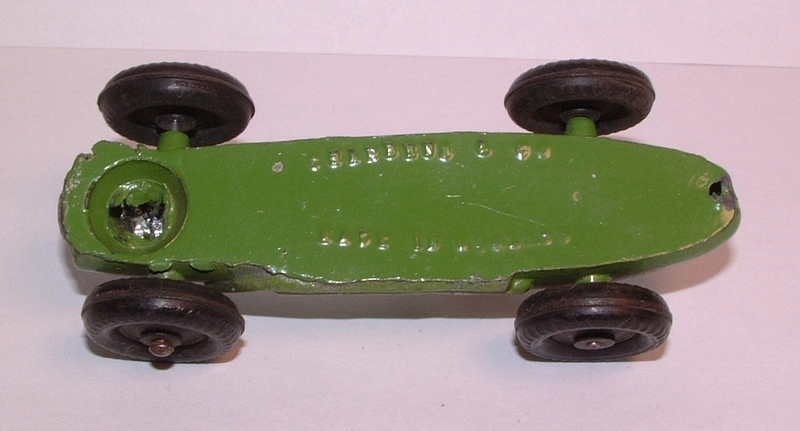 Copy of Dinky Toy no.233. Colour: Green. Length 101mm, 1955 to 1962, boxed in half dozens. 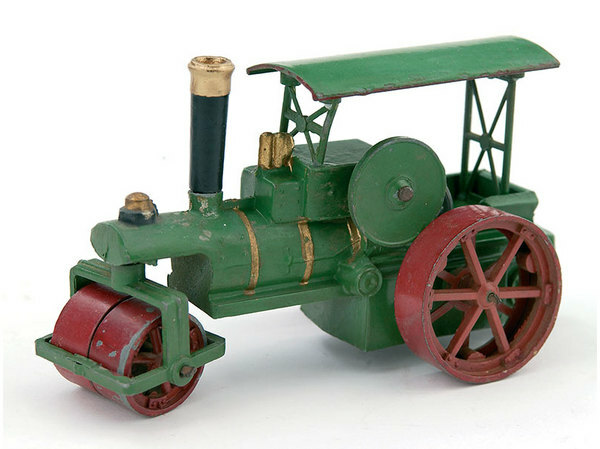 Copy of Dinky Toy no.234. Colours: Green with no lettering cast underneath, or blue with yellow nose and CHARBENS & CO MADE IN ENGLAND cast underneath. 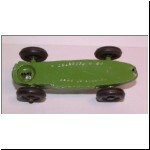 The green version also had the rubber wheels in a different style. 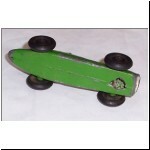 Length 255mm, 1953 to 1967, individually boxed. Identical in all respects to no.1 in the series but without the man and the leading horse. Usually has the later wood dowel chassis. 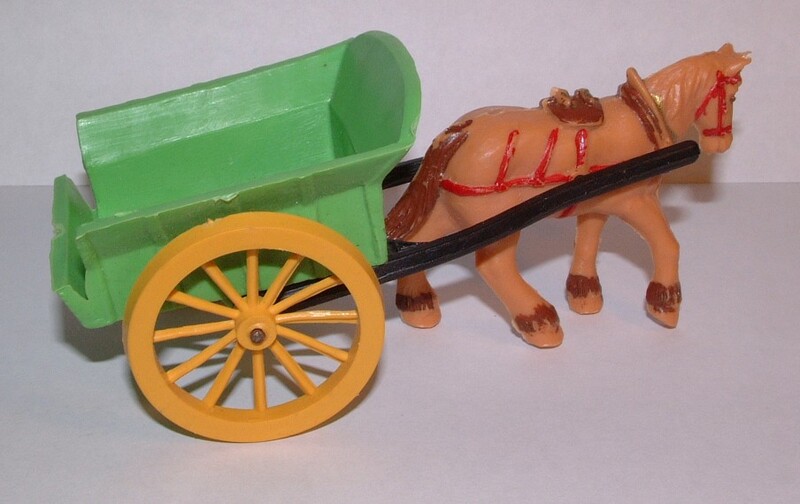 The horse was at first zinc diecast (cast in two halves), then hollow cast lead, and finally plastic. CHARBENS MADE IN ENGLAND cast on the front log support. 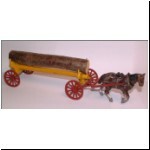 Colours: yellow wagon, dark red shafts and wheels, brown horse. 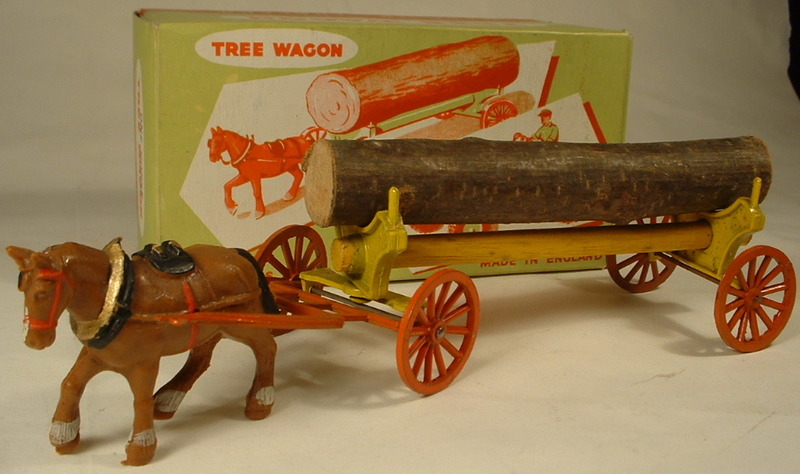 The later type of box (in the third picture) was also used for no.17 Tractor and Tree Wagon. 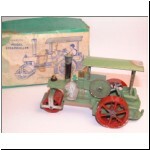 Length 104mm, 1950, then 1955, individually boxed. 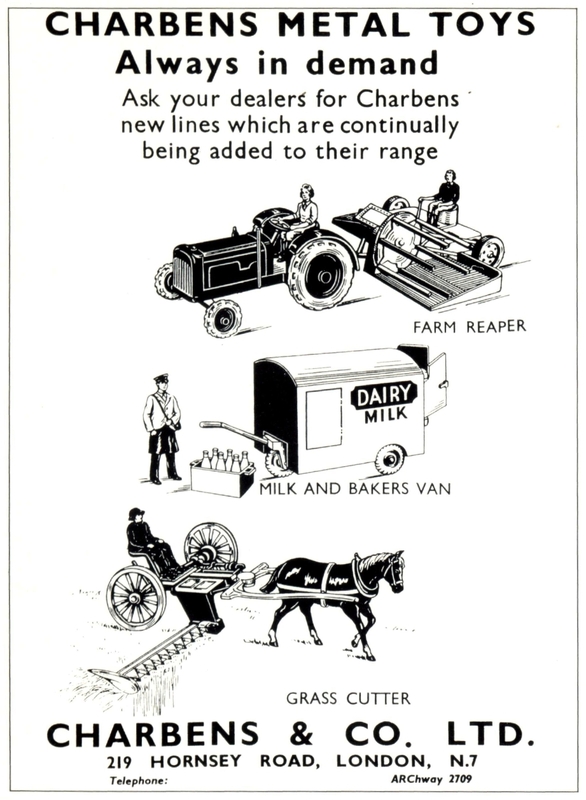 Before the war, Charbens had made a very nice lead horse drawn milk float, available in dark blue "Express Dairy" livery or in orange for "United Dairies" (see the pre-war article). 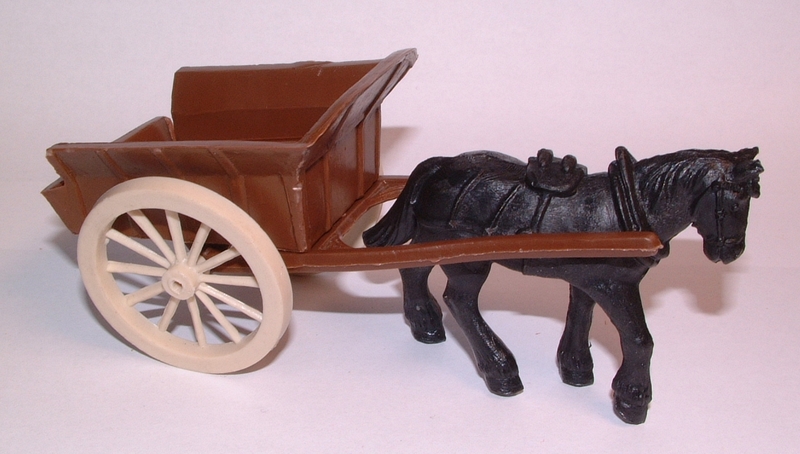 When tooling up for diecast production after the war, they must have decided to update their milk float to reflect the gradual disappearance of the horse from real-life streets, and so chose to model a pedestrian electric van. This is not the prettiest model, being a rather basic box with opening rear doors, but the accessories provide extra detail. 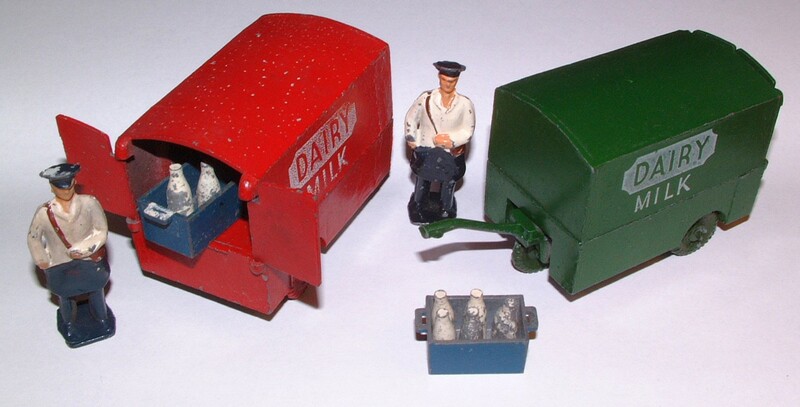 The milk van is usually dark blue, but also came in dark green or red. 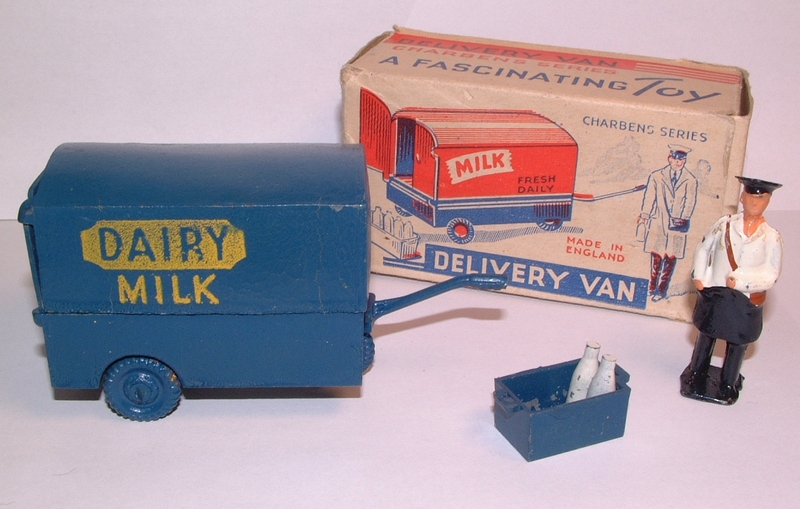 A large lead milkman was included, together with a diecast crate and six milk bottles. 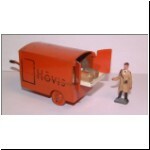 The van was also produced as a "Hovis" bread van, in which form a side door was crudely represented as part of the printed decoration. 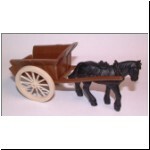 This version was supplied with a lead bread delivery man (the same man as with the horse drawn bread van, no.7) plus a diecast tray of loaves. The electric vans were included in the February 1950 advert in Games & Toys magazine, but had disappeared by the time the 1953 catalogue was produced (no doubt due to the 1951-2 zinc ban). 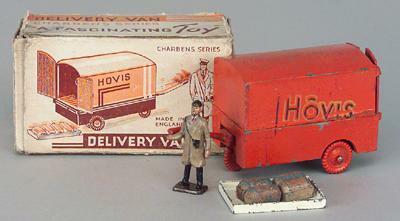 The van was reintroduced for the 1955 catalogue only, numbered 36. The catalogue illustration showed a two-tone model without lettering and with a man but no other accessories. 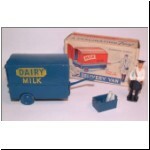 (1) Dark blue, dark green or red van, DAIRY MILK printed on each side, with milkman, crate and bottles. 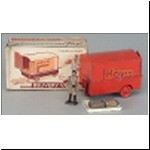 (2) Orange van, HOVIS printed on each side, with bread delivery man, tray and loaves. (3) Yellow upper half, red lower half and rear doors, black wheels and control handle. No printing. 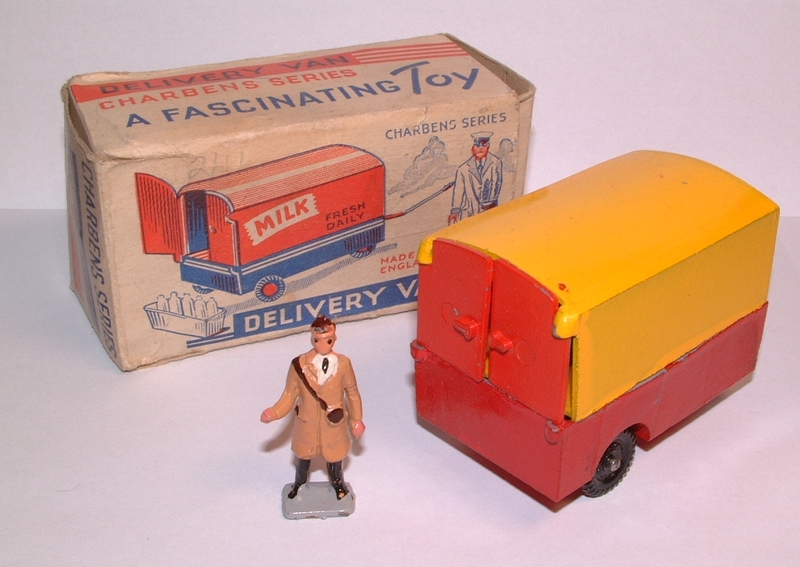 With bread delivery man, but boxed and catalogued as a milk van! (1955 issue). 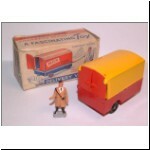 The electric vans are very hard to find in anything approaching complete condition. Length 142mm, 1957 to 1962, individually boxed. 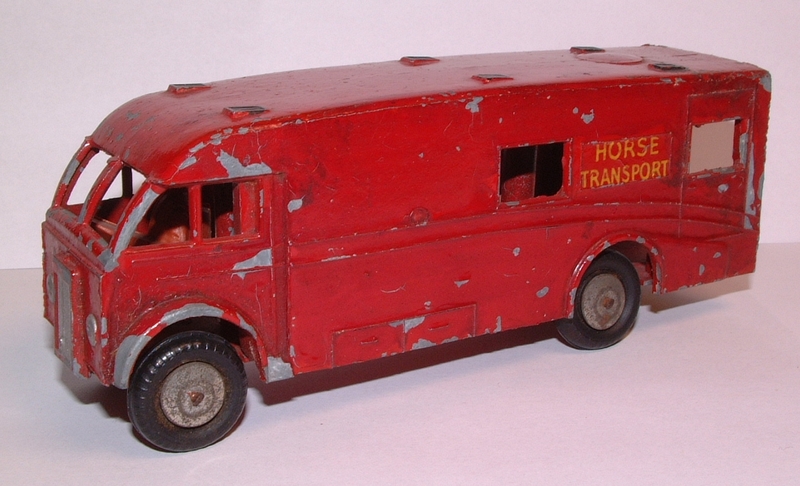 In the 1957 catalogue, number 36 was re-used for a new model of a British Railways type horse box. A photograph showing three discontinued models, no.30 Mechanical Horse, no.36 Electric Van and no.39 Phone Box, continued to be shown in the 1957 and 1958 catalogues! 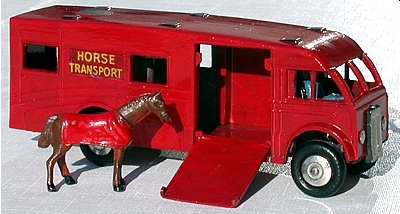 The horse box was probably copied from the Dinky Supertoy no.981. It had let-down ramps at the side and rear. 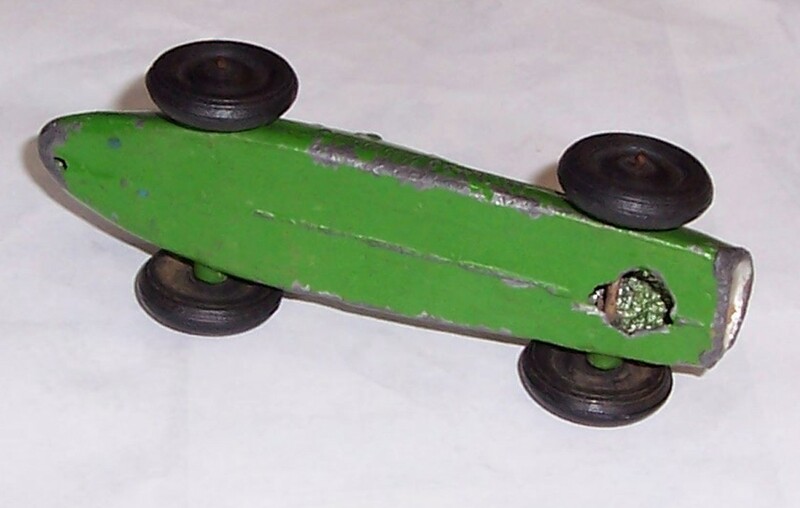 These ramps were sandwiched between the body and chassis castings, and unfortunately the ever present metal fatigue has often caused the body casting to expand so that the ramps have fallen out and been lost. 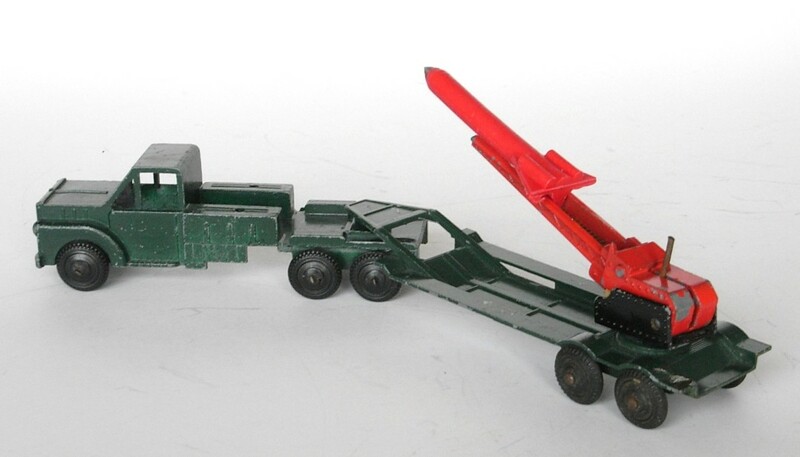 The Muir Hill Dumper driver (in metal or plastic) was fixed inside the cab. There was also a blanketed horse in cast metal. Wheels were the solid rubber type, but with shiny tin disc "hubcaps" added on both outside and inside faces of each wheel. 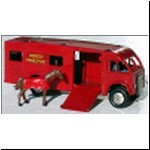 Colours: Dark red body and base, HORSE TRANSPORT printed on each side. CHARBENS MADE IN ENGLAND cast underneath. 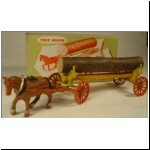 Length 134mm, 1967, individually boxed. 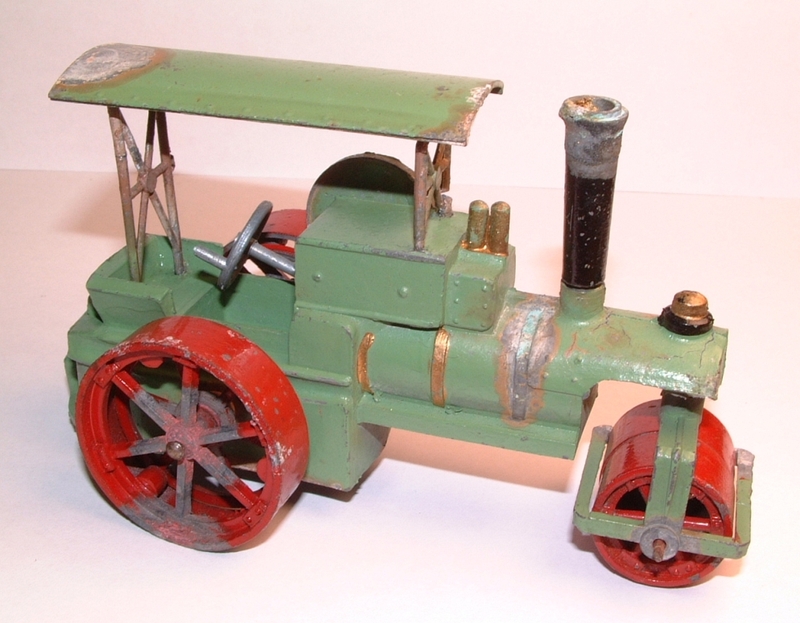 This model only appeared on the 1967 price lists, described as "Traction Engine, large model". Strangely, the number 36 was again re-used. 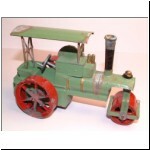 It was not described as a Steam Roller - that designation was still being used for the Diesel Roller, no.28! 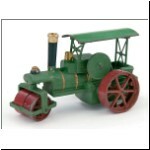 The large Steam Roller retailed at 12s 6d, compared with (for example) 6s 11d for the Travelling Zoo, 4s 6d for the Tractor and Reaper and 2s 11d for the Horse Drawn Roller. However an early box has been found with the price of 3s 6d written on it in pencil, which must be from a much earlier date. 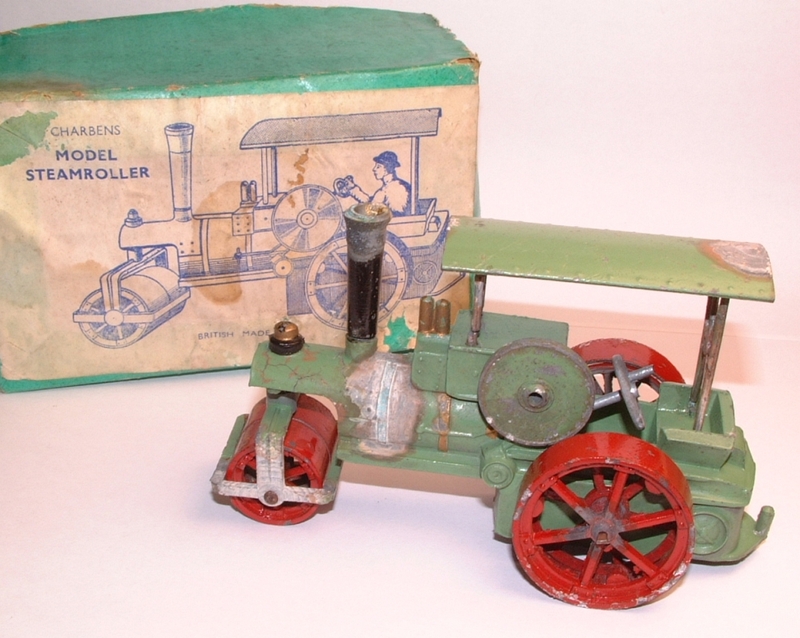 It seems likely that the model was produced in the late 1940s, but like some others was discontinued in 1951 due to the zinc ban, so was not included in the numbered series in 1953. Maybe its reappearance in the 1960s was Charbens' attempt to take some of the market for Models of Yesteryear - or perhaps they just found a few gross in the store room and included it on the price list to clear the stock? The model is nicely detailed and very hard to find complete - the roof supports are fragile if they have any degree of metal fatigue, while the separately cast chimney is easily lost. A driver is shown on the box picture, but all examples I have seen have been without drivers. MADE IN ENGLAND cast underneath. 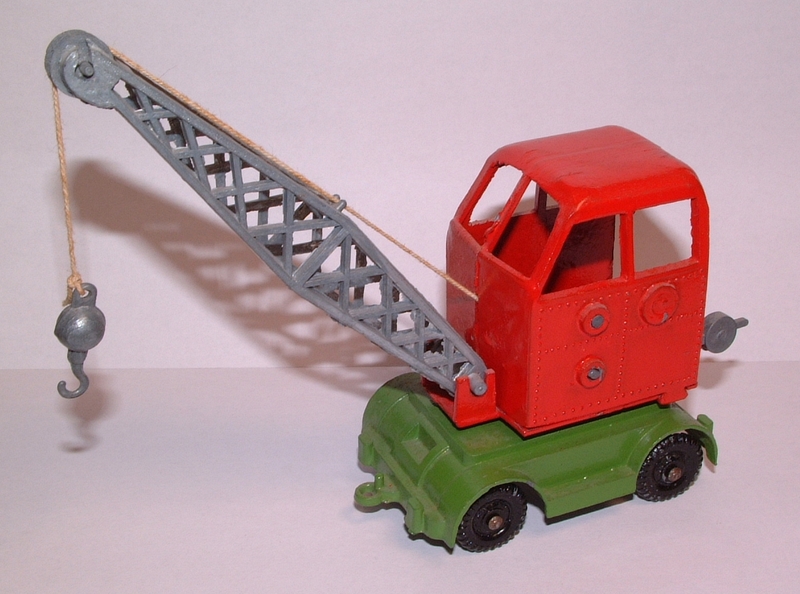 Colours: Light or dark green, red wheels, black chimney, unpainted control wheel. 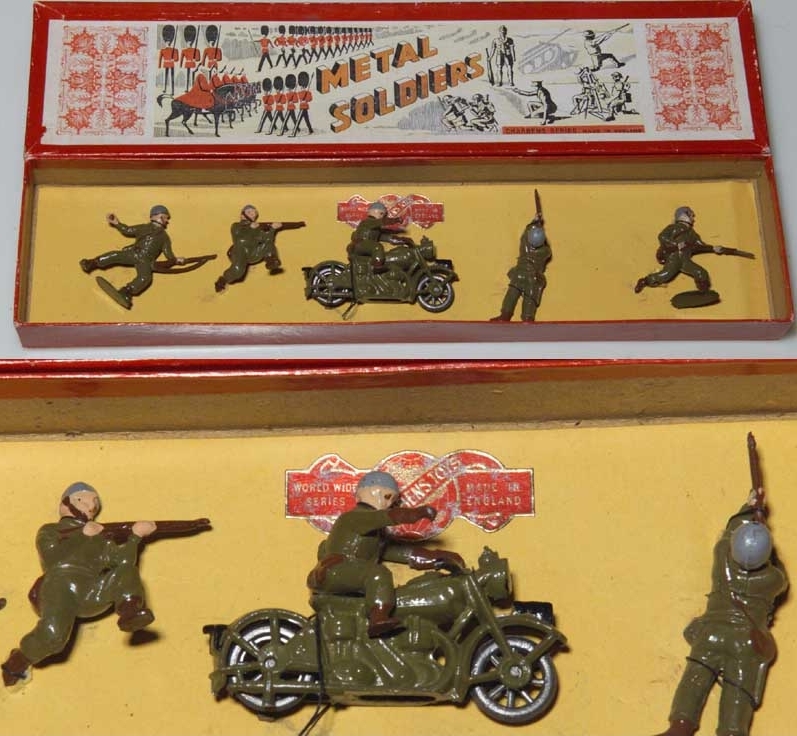 Length 237mm, 1960 to 1962, individually boxed, continued to 1968 in sets. 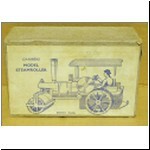 This model was listed in the catalogues but not illustrated, and the Charbens name does not appear on it. 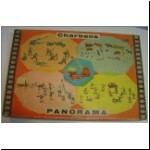 It was not until I saw one of the Panorama Series boxes that I knew this was the item in question. It would have been inspired by the Corgi "Rocket Age" models and the similar missile launcher made by Crescent. 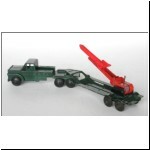 The casting of the articulated lorry is a thin, light diecasting, quite unlike the earlier crude and heavy Charbens toys. 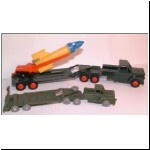 It bears a close resemblence to the Sentry Box Series tank transporter, made by Kemlows (shown in front of the Rocket Gun in the first photograph above). I would think that the Charbens die was made by the same sub-contract toolmaker. 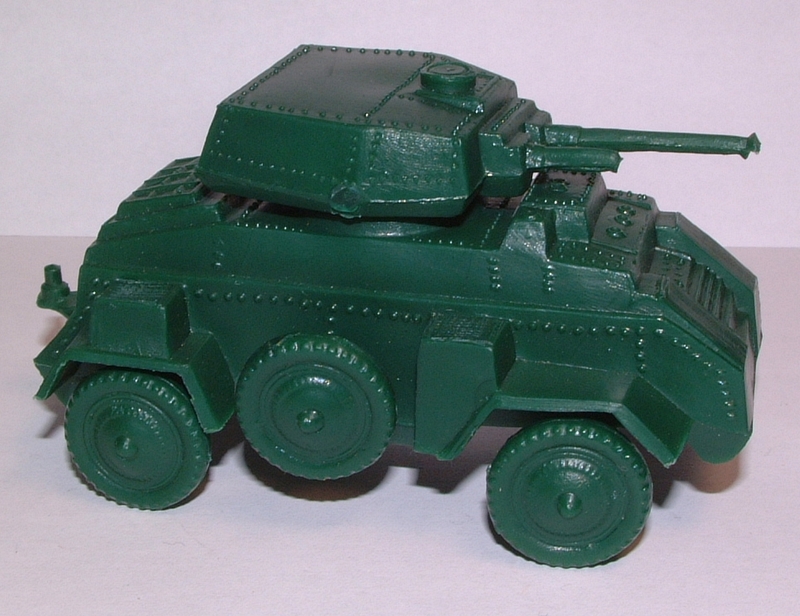 This model was still listed in sets in 1968, but was probably being sold from stock, because the die was sold to Israel in the mid-1960s, along with other dies from North London makers River Series and Kemlows (and including the Sentry Box tank transporter). 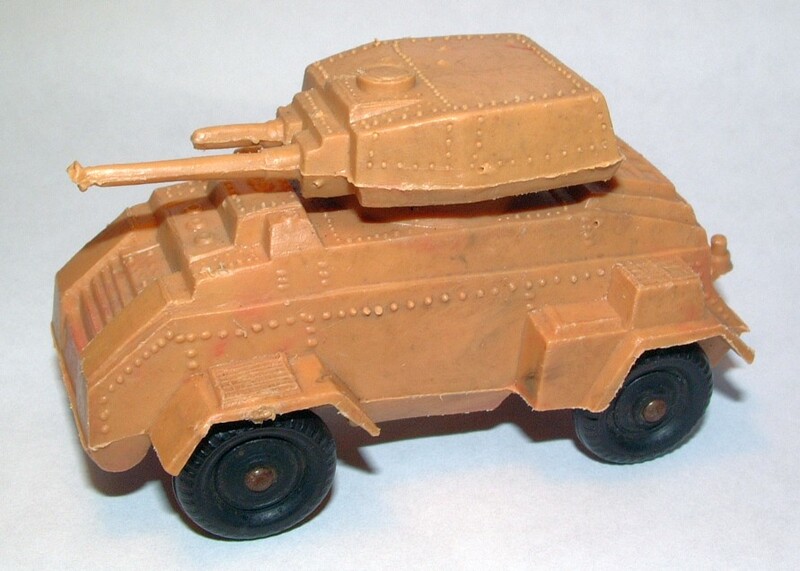 An Israeli version of the Charbens model has definitely been seen, painted a sand colour, but seems to be so rare that I could not locate one for a photograph. 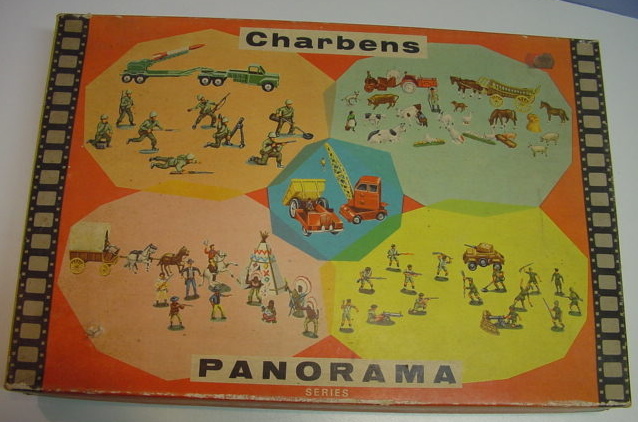 The Charbens model has MADE IN ENGLAND cast under the trailer, and wheels are the standard Charbens plastic type (in red or yellow plastic) with rubber tyres. 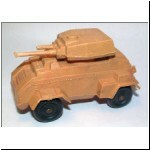 It can also be found with solid rubber wheels, as on some River Series toys. 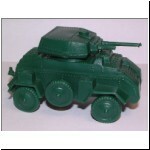 Colours: Very dark green or medium green truck and trailer, orange spring loaded missile launcher mounted in a black or green rotating cradle. The missile shown (in blue and yellow plastic) may not be the correct original type since it is different from the one in the Panorama box picture. It has a spring-loaded tip into which you can place a cap (for toy guns) so that it goes "bang" on impact. 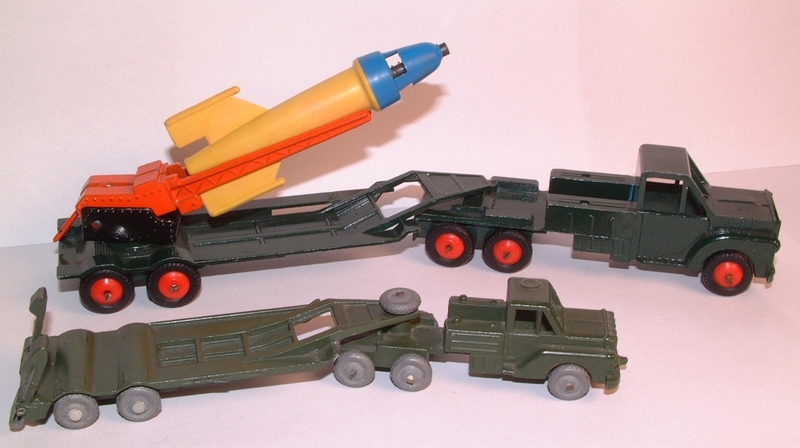 The red plastic missile in the second photo appears to be the original type, having a square section on one side which fits firmly between the two arms of the missile launcher. 1955 and 1960, individually boxed. 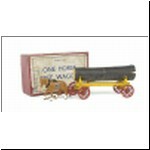 This was a money box with a gun (it looks like a sort of catapult) to fire coins into it. Both pieces were fixed on a base. 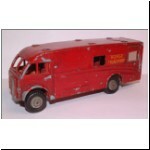 It was pictured in the 1955 catalogue, as no.37, then did not appear again till 1960 when it was numbered 38 and the rocket gun lorry was 37. 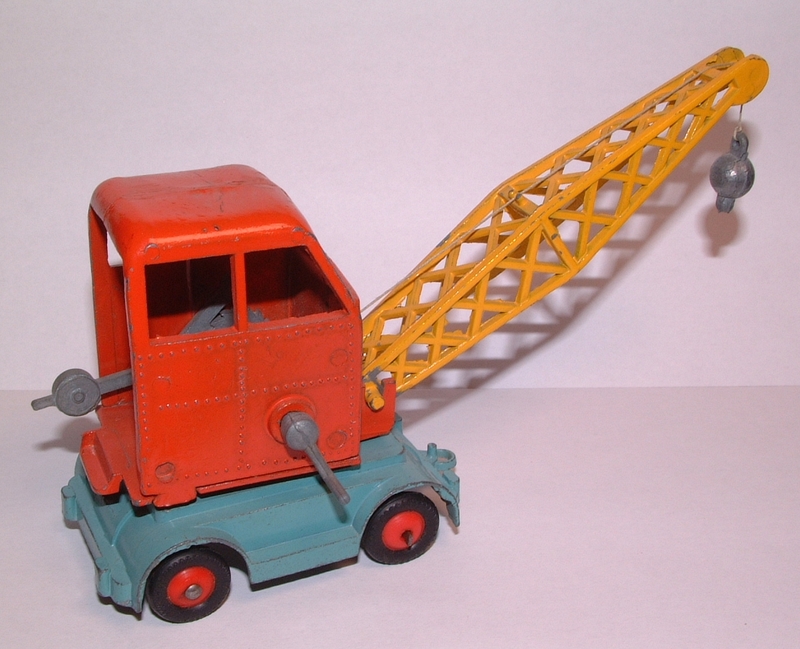 No.38 in the 1955 catalogue was listed as a Mobile Cement Mixer, but no price was given and I suspect this was never issued. Height 53mm, 1955, boxed in dozens. 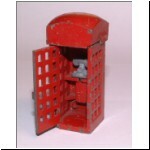 This was a zinc diecast phone box with opening door, painted red of course. 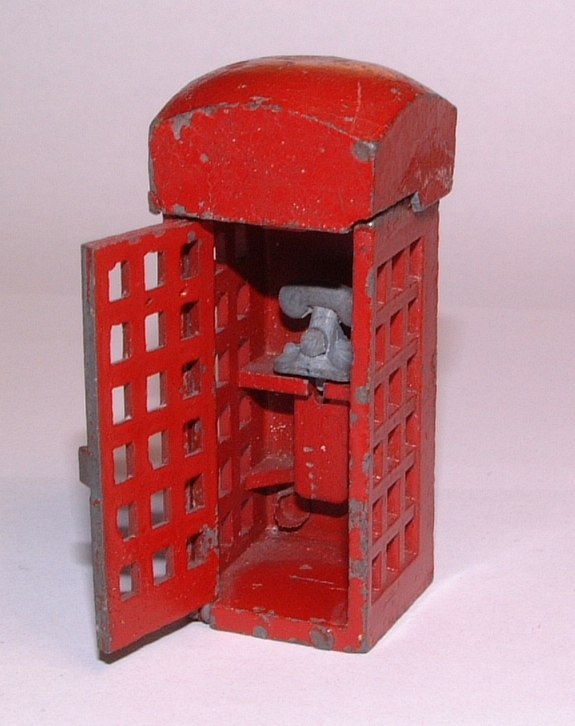 Often missing is the separately cast unpainted telephone. No identification on model. Length 101mm, 1955, individually boxed. This was the fire engine from the Disney series, but with five firemen who were the driver casting from no.15. 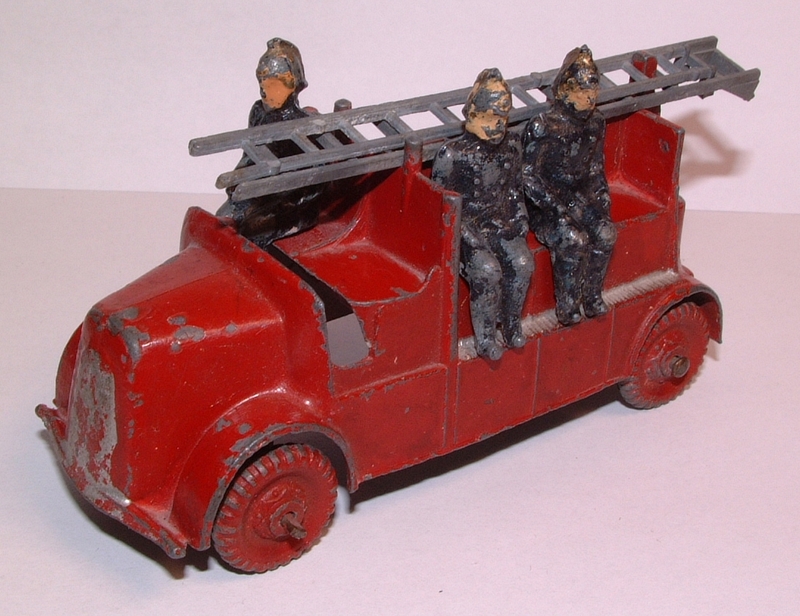 The double ladder was supported at the front by a T-shaped casting which always seems to get lost. CHARBENS MADE IN ENGLAND was cast underneath. 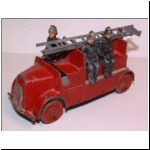 Colours: Red, unpainted ladders and support, black firemen. Width 70mm, 1955, boxed in half dozens. Charbens made quite a number of items of lead dolls house furniture before the war. 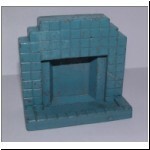 This fireplace was a more modern 1950s design, and was zinc diecast rather than lead, with the hearth as a separate casting. CHARBENS MADE IN ENGLAND was cast on the back. Colurs: Red or light blue. Length 78mm, No.207 (1953), No.211 (1955 to 1960), boxed in dozens. 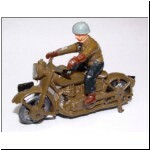 The Charbens motorbike was not part of the numbered vehicle series, but is worth a mention. Pre-war motorbikes were different, with non-moving wheels. 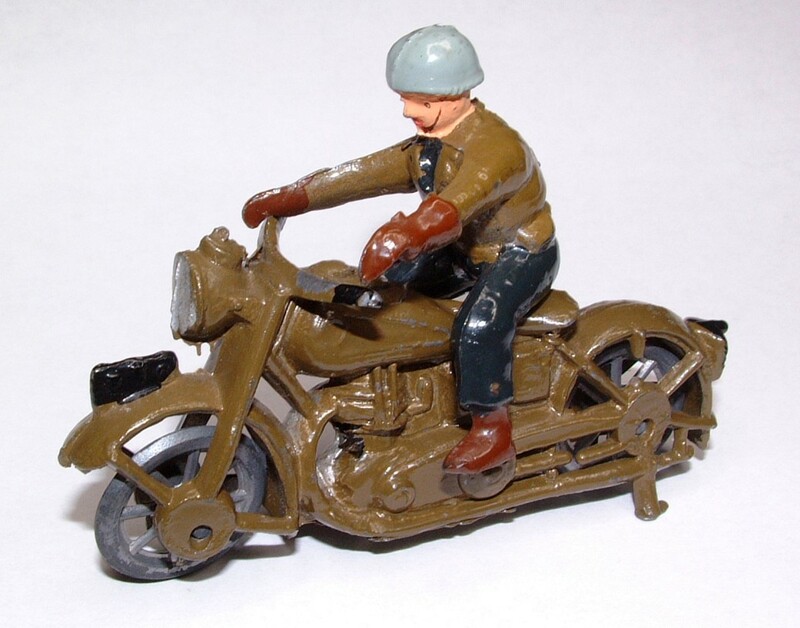 There was only one post-war motorbike, which was a lead slush casting, and the rider was lead hollow cast. CHARBENS MADE IN ENG was cast underneath; later CHARBENS was cast on the petrol tank on the left side and MADE IN ENGLAND on the right side. The front number plate had ENG on each side. 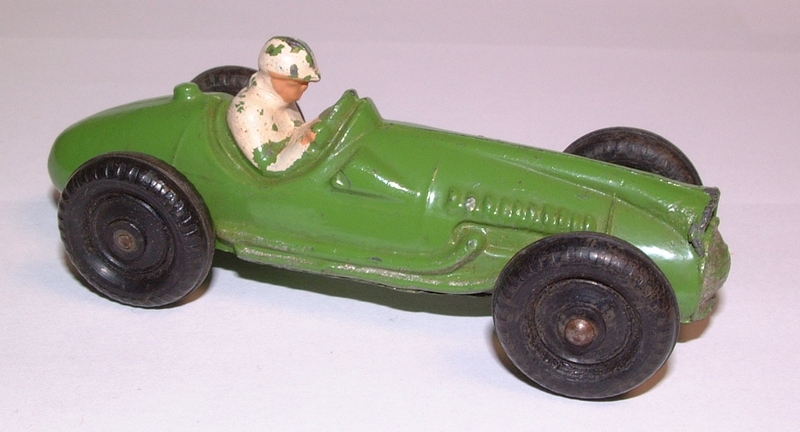 Colours: Khaki with unpainted wheels. 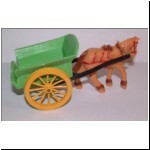 In the original article I stated that the Horse and Roller was produced in plastic, but I now believe that was incorrect. Reproductions have been made of the Farm Wagon and Armoured Car by Plastics from the Past*. Probably at least some of these continued into the 1970s, but I have no catalogues or price lists after 1968. 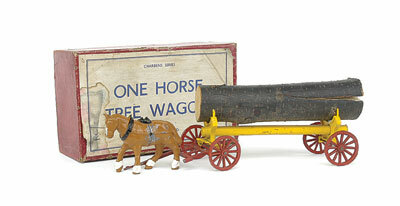 Gone are the days when the crude Charbens toys were consigned to the junk boxes at toy fairs! 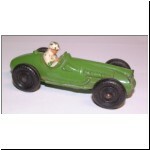 We can now appreciate them for their charm, their role in toy car history, and in many cases for their rarity. I hope this article will be a guide to many more collectors. If you have anything to add, please e-mail me. Finally I must thank Vic Davey for the catalogue copies, and Patrick Trench and Peter Wade-Martins for additional information. Thanks also to Vectis Auctions and to Michel Sordet* for several photographs. A small number of other photographs have been taken from online auctions and I do not have the names of the photographers, so if you see one of your photos here, thank you.